TORONTO—A new survey suggests Canadians of all generations are more likely to honour military veterans by attending a Remembrance Day ceremony this year. A poll commissioned by Historica Canada, the organization behind the popular Heritage Minutes videos, found a 10-percent spike in the number of respondents who planned to take part in a ceremony this year compared to 2017. The online poll, conducted by Ipsos, found 39 percent of those surveyed had firm plans to attend a ceremony on Nov. 11 compared to 29 percent the year before. The survey found plans were relatively consistent across demographics, with millennial respondents expressing the most consistent enthusiasm for attending Remembrance Day events. It found 41 percent of 18- to 34-year-olds polled planned to attend, compared to 40 percent of respondents over 55 and 38 percent of participants between 35 and 54. 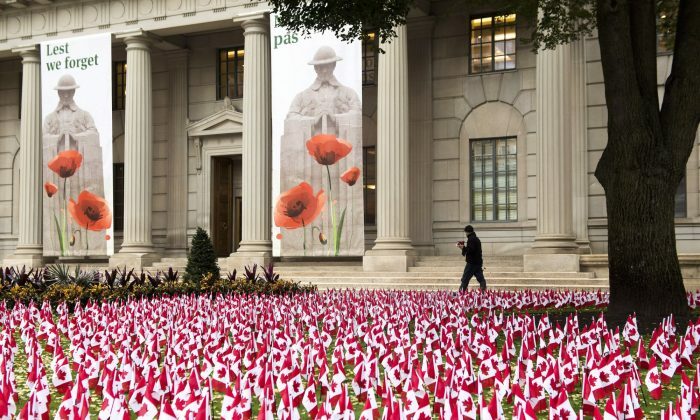 The poll found 95 percent of those surveyed felt Remembrance Day ceremonies should honour veterans of recent conflicts. It also found 83 percent of respondents planned to wear a poppy in the run-up to Nov. 11, with baby boomers showing the most enthusiasm for that idea. Participants in British Columbia were most likely to have done so, the survey found, noting the provincial response rate of 64 percent was well above the national average of 46 percent.